The Metabones Canon EF Lens to Sony E Mount Camera T Speed Booster ULTRA II improves on its predecessor, the Metabones Canon EF Lens to Sony E Mount Camera T Speed Booster ULTRA, by incorporating a new optical design with extraordinary sharpness with reduced distortion and vignetting. This electronic adapter allows you to pair Canon EF mount lenses with Sony E/FE mount cameras and increases the effective field of view and the maximum aperture of the lens you're using. This combats the crop factor of your APS-C camera (or APS-C mode) while allowing you to use your favorite Canon EF mount lenses. This recent ULTRA redesign is made specifically to perform better with the professional-grade glass found in Canon's L series full frame f/2.8 zoom lenses. This Speed Booster works by shrinking the image circle of your Canon EF lens down to better fit APS-C 1.5x crop sensors. This has the effect of making the field of view of the lens 0.71x wider or, in other terms, reducing the crop factor of the camera from 1.5x to 1.07x – nearly full frame. Additionally, by concentrating the image circle from a lens, this Speed Booster also "brightens" the image – maximum lens apertures are increased by approximately 1 stop down to the sub-f/1.0 range. Lenses like the Canon 24-70mm f/2.8L II and Canon 70-200mm f/2.8L IS II become 17-50mm f/2 and 50-142mm f/2 high-speed zooms, respectively. Lenses like the Canon 50mm f/1.2L become an effective 35.5mm f/0.9 lens. 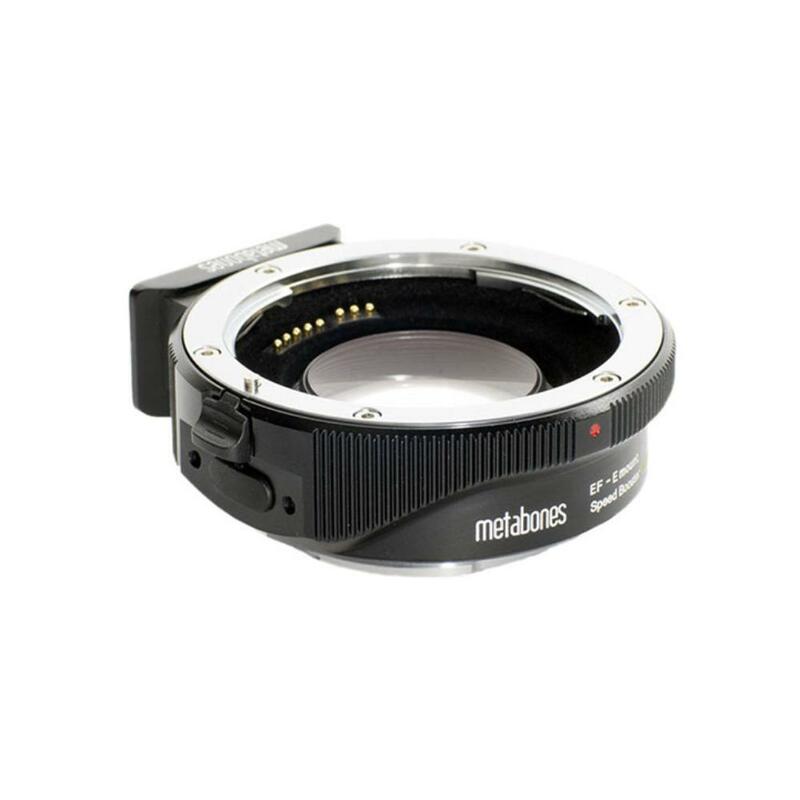 Please note that these effective focal ranges quoted by Metabones are in full frame terms. You still have to consider the 1.5x crop factor of your APS-C Sony camera (or APS-C Sony mode), making that 35.5mm equivalency read more like 53.25mm. This is the point of the Speed Booster. It allows the full frame lens (in this example, a 50mm) actually produce a field of view closer to 50mm rather than the 75mm effective view you'd get with a straight (non-boosting) adapter. In addition to this is the aperture boost. This adapter is ideal for those who want to use their full frame Canon lens collection on Sony E mount cameras that have either APS-C sensors, Super 35 sensors, or ASP-C/Super 35 modes without sacrificing angle of view. • This Speed Booster is compatible only with EF mount lenses and not Canon EF-S mount lenses. • This Speed Booster is designed for cameras with APS-C sensors. If you are using a full frame E mount (FE) camera, please make sure "APS-C/Super 35mm" is set to either "Auto" or "On". • This Speed Booster will not operate correctly when trying to use it on Canon's CN-E collection of cinema lenses for still photography purposes. This Speed Booster is functional with Compact-Servo CN-E lenses but note that some do not fully cover APS-C/Super 35mm when paired with this adapter. • The first two AF attempts are used to calibrate the lens. Half-press the shutter release button again after that and AF will lock successfully. • Autofocus is supported with this Speed Booster but with certain contrast/phase detection limitations. Please see the notes below about lens compatibility. • If you are attempting to pair both a Canon lens with a Canon extender to this Speed Booster, autofocus is disabled if the combined maximum aperture of the lens and the extender is f/5.6 or smaller (higher number). Note that this adapter is not at all compatible with Sony extenders. • Use of this Speed Booster with a body using an aftermarket battery grip may result in strange aperture changes. Turn off the battery grip if you experience this. Behavior is not found when using Sony-branded grips. • For the a7 III and a7R III, Eye AF is not supported for movie recording. AF-C can only be used when Phase detection AF is selected but focus is fixed at the first frame. • Dedicated Switch Controls In-Body Image Stabilization (IBIS) on Sony Cameras with SteadyShot INSIDE.